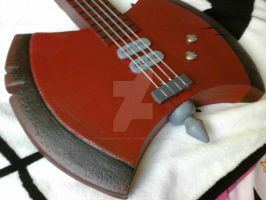 Finally finished with Marceline's axe bass guitar! I started it on Monday (6/6) and finished this morning. I made it out of insulation foam, sanded it, gorilla glued it, painted it, and detailed it all by myself. This is the first prop I've ever made for a cosplay and I'm very happy with how it turned out. Stay tuned later this weekend for pictures of my complete Marceline cosplay! I used the pink insulation foam from home depot, shaped it with a saw, glued it together with Gorilla Glue, let it dry. I painted it with Mod Podge (gesso), let it dry, paint it with acrylic. The strings are just silver elastic that you can buy at any craft store. The nobs are painted bottle caps. The tuner prongs on the top are just little wooden nobs that I bought at a craft store too. Nice, I love your other work btw. Very creative and amazing craftsmanship. I've always loved Marceline and Marshal Lee. Adventure time rules. Can you really play with this bass? Excellent work. 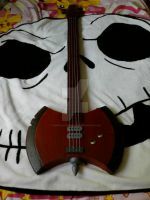 I'm planning to make my own bass guitar battle axe for displaying in my art room studio, and for a future Marceline cosplay. Steps are listed in the description! Can you tell me how long and thick it is? Could i have the dimensions for the guitar? Was mod podge supposed to be to seal it? What kind of foam did you use? I used pink insulation housing foam. Yes, the pod podge did act as a sealant and primer for my acrylic paint. I waited for it to completely dry before using the paint. I used blue insulation foam,its about the same right? how did you attach the handle to the head or did you just make the entire thing out of a single piece of foam? Technically it was made from 6 separate pieces of foam. two pieces stacked on top of each other for the head, two for the neck, and two for the axe part. I cut a sort of puzzle piece wedge to interlock the pieces together. I glued it all together with Gorilla Glue. Hope this helps! OMG im going as Marceline for a CT con i really wish u were selling it i would totally buy it about how much did it cost to make? Yep! I let it dry before painting the acrylic on. Good luck! First off, I want to saw that you've done an awesome job cosplaying as Marceline. Welll the materials I used were for my low budget. I think for like $40 it was pretty cheap. I honestly don't recommend using much cheaper materials, or else your guitar will look... well.. cheap. Good luck! Okay, thank you! ^^ I'll see what all I can get together. AWESOME!!! How did you do that??? Thanks! It's explained in the description. thank you for posting this its a really good ref i'm using for mine! Fantastic! I need to get started fabricating mine. the wires are real guitar wires?! Thank you! Sorry I don't have the dimensions. I kind of just guessed! Are you like selling these? I hope you do! Cuz it's really awesome! No sorry, I'm not. But thanks! !